Iam grateful for many things and I’ve just discovered one that I’d never thought of before: my surname is not Willys. (Think about it.) Whether or not the inventor John Willys (1873-1935) liked his family name I don’t know. But It doesn’t matter; the Willys Jeep appeared in 1941 and was a blessing to military units anywhere and everywhere – and when the war was over, farmers everywhere loved it. Find the steepest hard-baked field you can, have it scattered with crevasses and just go. The Jeep could carry a quarter-ton over this sort of terrain with ease. Of course, things could go wrong. Not many, but when something as reliable as a Jeep goes wrong it does take you by surprise. I was in India, between jobs and making myself useful as Driver. And so I met the Jeep. It was 1944. The terrain from Transport to Armoury was virtual wasteland. Well-baked wasteland. I loaded, got in, checked the feel of the gears and clutch, found the ignition, started up and went. It was great. I got the feel of it and I began to like it. My bottom and the seat parted company frequently. I felt the accelerator leave the sole of my shoe and drop to the floor. We leaped forwards, engine screaming at full revs. I glanced down. The pedal was just lying there. Now, you’re thinking,‘Why didn’t you just switch off, you idiot.’ But that isn’t what I was thinking. No. I am a straightforward thinker in these matters and, to me, the obvious solution was to lift the pedal and keep my toe under it. While looking ahead, I crouched and felt around for the pedal. I could feel it but I couldn’t get my fingers under it. It was, smooth, heavily worn, and flush with the metal floor. By the time I had thought of the ignition we were quite a long way past the Armoury. I braked, we stopped. I got out, shaking, and walked back to the workshop. Don’t ask me what I said because I’ve forgotten. 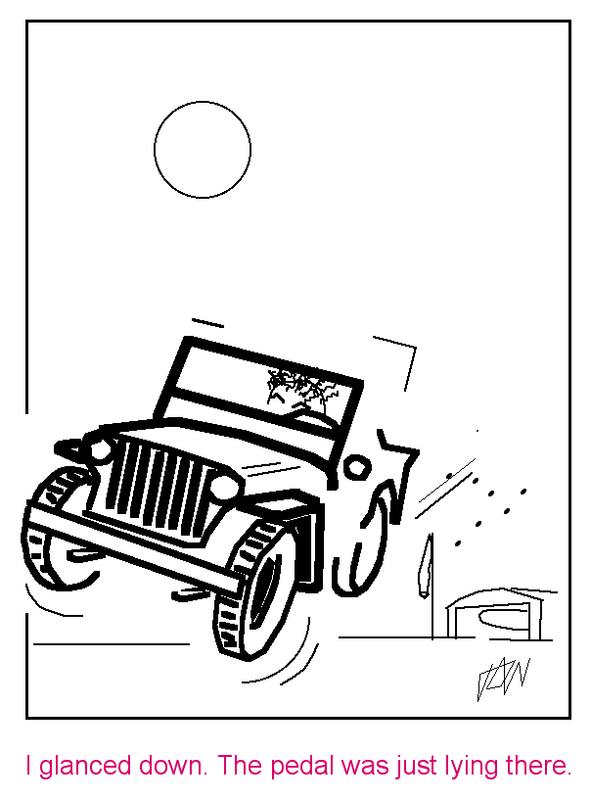 This entry was posted in Autobiographical and tagged accellerator, armoury, Battling with the unknown, clutch, driver, farmers, Flight Sergeant, gears, ignition, India, Jeep, John Willys, military units, my bottom, wasteland, Willys, you idiot on 09/08/2010 by Paul.